Many people think or assume or suppose that I would like to have one of those fairy gardens that are filled up with plastic garden fairies. Truly, I would not like such a thing. I would never insult Thorn Goblinfly and all the other garden fairies here, including the McGarden clan who all live in the vegetable garden, Ol' Rainbow Tanglefly, who has had more close calls with his life than anyone I know, and Sweetpea Morningdew who is a bit of a gossip but has a good heart. They just wouldn't know what to do or think if I set out some plastic garden fairies here and there in the garden. They'd probably laugh and then play tricks on me for doing such a thing. Here at May Dreams Gardens, we prefer to just plant the kind of garden that will attract garden fairies, and leave the plastic garden fairies for others. What type of garden attracts garden fairies, you ask? Why, the same kind of garden that attracts birds and bees and bunnies, of course! Garden fairies do not like plastic! PGF? No. 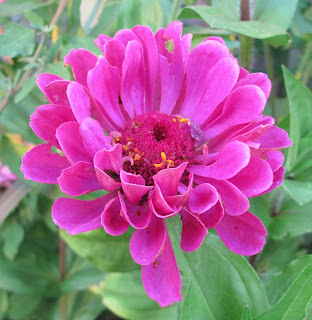 But, that is the perfect zinnia. Garden fairies like moss, leaves, twigs, rocks, shells, sand, flowers, feathers and all things from nature. Definitely not plastic. I do agree! Definitely not plastic! The fairies would make you pay if you did such a thing. i couldn't agree with plastic because natural beauty is natural. My granddaughters would disagree about plastic fairies. So would the little girls next door, and the daughter of the man who mows my yard. To them it looks magical!